The uses, shapes and designs of false ceilings are endless. They can be built in any room in the house and can help us hide lighting, heaters and even door frames. However, its role goes far beyond the functional. With a false plaster ceiling, you can separate different areas of a room without having to resort to walls. You can also visually lengthen hallways or even highlight the decor and design of an old ceiling. This is why today at homify, we have put together 10 ideas for a useful and functional ceiling. We hope you will find the inspiration to introduce your own false ceilings into your home design for a new and refreshing look and feel! Not only is a plaster ceiling functional but it can be decorative too. 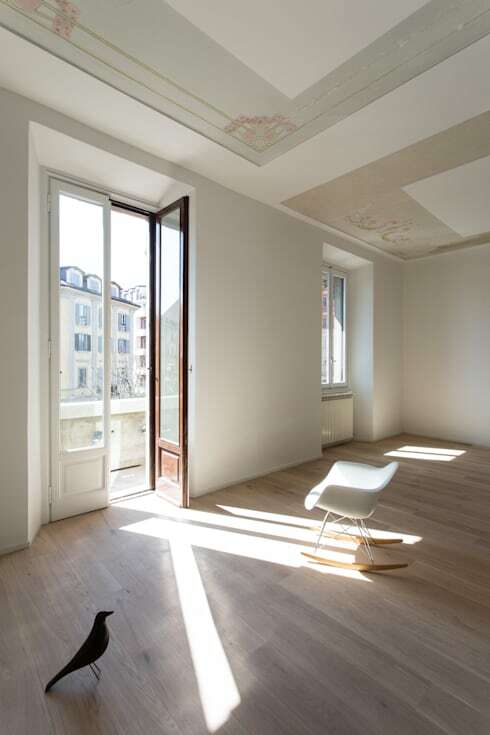 In this modern and contemporary apartment, we can see how the ceiling has given life to the luminous living room. It also separates spaces, which means that no wall was needed to divide up the entrance hall from the living space. This room used to be split into two, as we can see by the original ceilings, but the plaster ceiling now reinforces the separate areas while uniting the space. This is an idea to copy if you live in a home with decorated ceilings. A false ceiling can consist of an insert or it can occupy the entire roof surface. In this house near Venice, architect professionals Sanson have created a plasterboard ceiling, which covers the excess height of the staircase. The white tones of the lacquered gypsum ceiling are enhanced by the lighting, contrasting beautifully with the oak floors, while the structure itself highlights the functional staircase. 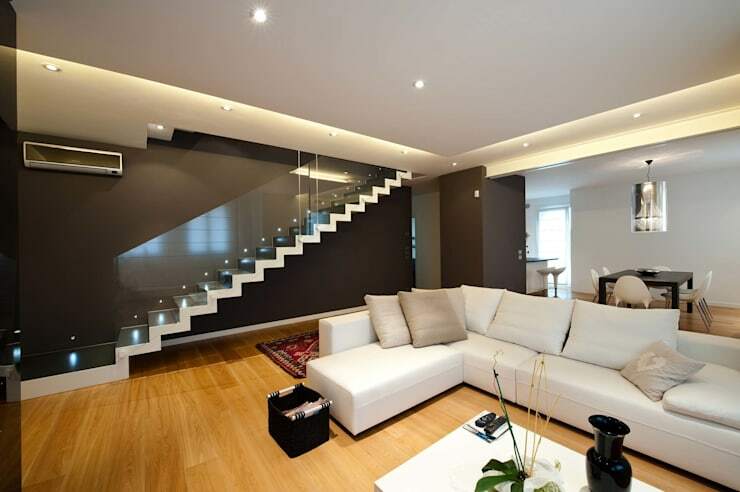 The metal staircase and glass railing thus becomes a focal point and design element in itself. 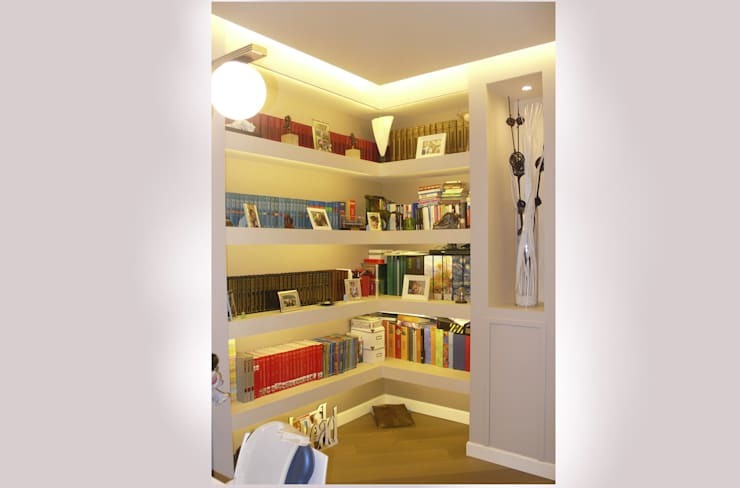 Here is an example of false ceilings combined with a set of shelves, that is made entirely of plasterboard. 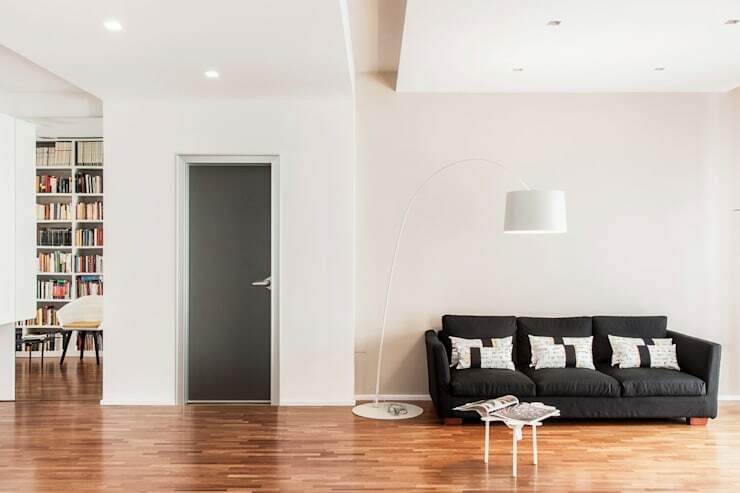 This Italian apartment was remodeled and with only 80 square metres to spare, the space was distributed according to the needs of the owners. 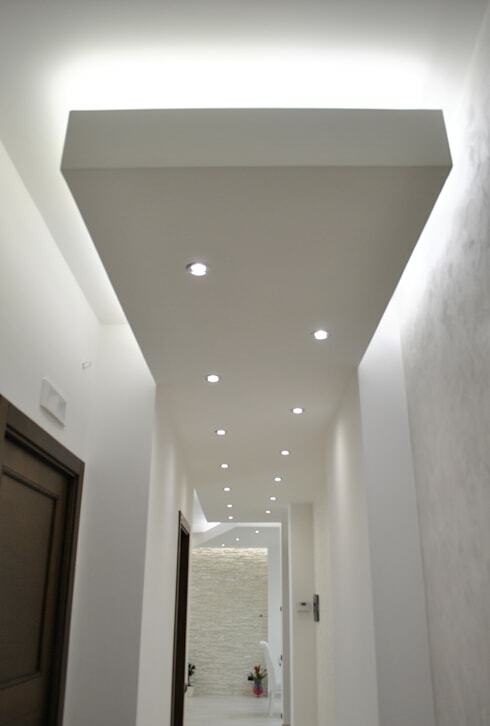 To give light to the little space, the false square ceiling has been designed with lights around the perimetre. The shelves below it also feature gorgeous lighting, enhancing the books and accessories on display. If you are looking for a spot for your heating or air conditioning, a false ceiling can come in use. This is the solution that Giorgio Petteno Architects came up with this in this apartment in Venice. The central room has been equipped with a ceiling, which incorporates fluorescent lights as well as air ventilation that is located above the door of each room. 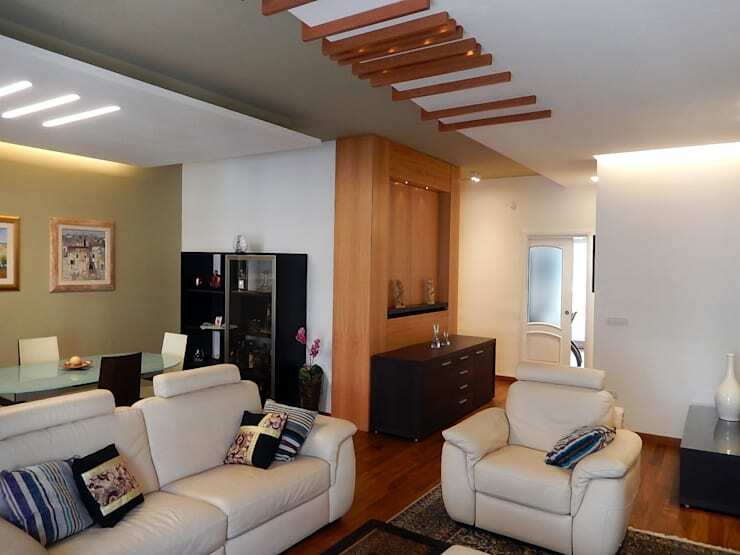 With a false ceiling, you can create a wonderful ambiance in your home as well as a unique effect. Just look at this gorgeous corridor! 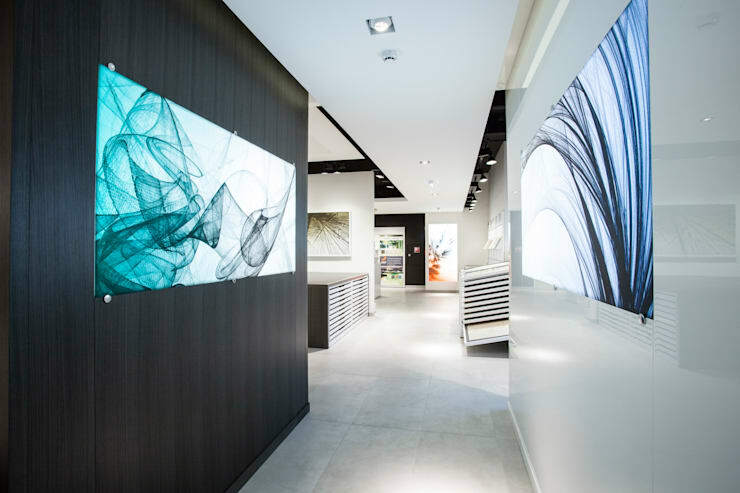 With a low height, this ceiling visually lengthens the corridor while the LED lamps give rise to a gorgeous, luminous path. Have a look at these dazzling lighting ideas for modern homes for inspiration for your own home! A roof does not only have to be linear, it can also have sinuous curves. In this design, we can see how the false ceiling, which covers two areas of the home, improves the logistics of the space. 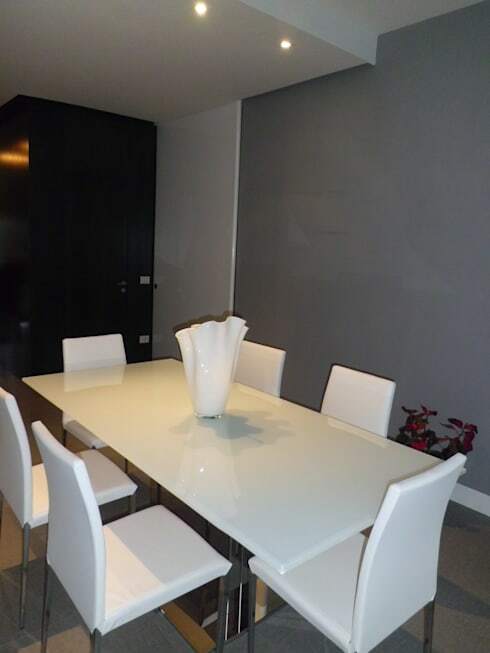 On the one side we have the sofa and living room area while on the other side we have the dining room. The only partition is the open space! This modern and savvy concept is perfect if you have two environments but you don't want to obstruct them. Have a look at these other tips for how to stylishly split a room without a wall. This white ceiling has been positioned above the dining space with its white tones contrasting drastically with the dark grey walls and black door. 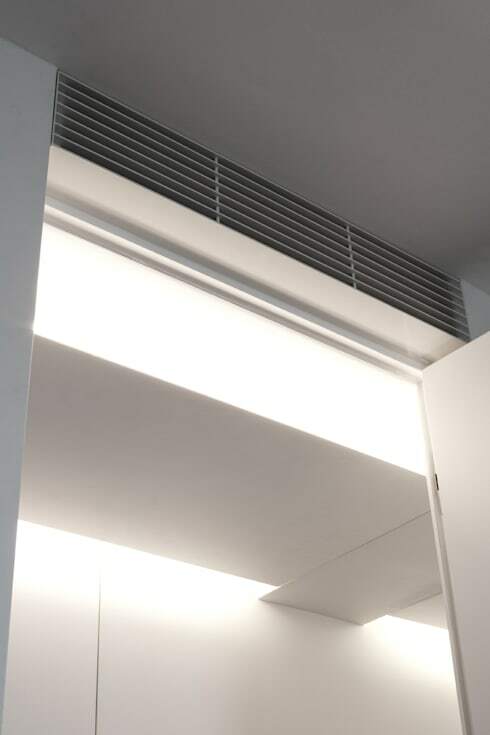 The false ceiling has bee installed to conceal the lights and keep them neatly positioned. Even the door frame, which is the centre of gravity of the house, disappears in this plaster panel. In this beautiful home, the designers have created an elegant environment made of light tones and fine materials. In the dining room, above the round table, two lamps drop down from the false ceiling providing this space with functionality and style. 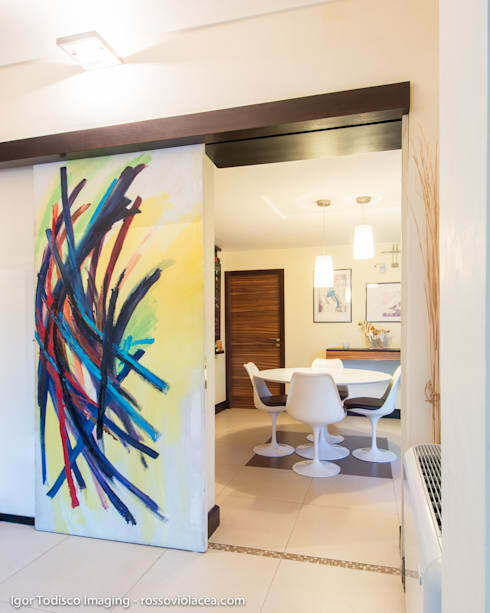 Don't you love how the false ceiling works in harmony with the colourful artwork and the flawlessly lacquered wooden door? In this design, we come across a very creative solution. In the space that divides two areas—the living and dining rooms—the false ceiling is fragmented. There are also wooden beams inserted above the living area. This creates a masterpiece of design right above the living space! False ceilings are not exclusive to the interior spaces of a house. A false ceiling can also be used in a commercial space, as we can see in this gorgeous show room. In fact this space is made up of 800 square meters and a false ceiling fits in flawlessly! If you've enjoyed this article, you'll love this one too: 6 Brilliant ideas for a stylish ceiling. Which false ceiling would you go for? Comment your thoughts below!